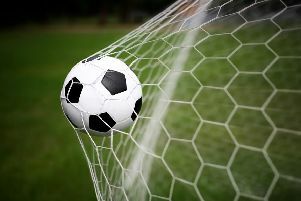 Selsey bowed out of the SCFL D1 Challenge Cup at the quarter-final stage at the hands of runaway league leaders Little Common, but they went down fighting in a 2-0 defeat. On a very bobbly pitch and with a strong wind blowing, the game was not one for the purists. The home side kicked with the wind at their backs first half and dominated possession but were unable to breakdown a resolute Selsey defence. The Blues, who are an almost unrecognisable XI from the high flying side that started the season, were well organised and difficult to break down and with only one recognised defender available they started the game with top scorer Jake Goulding at left-back and central midfielder Toby Lynch at right-back. Both had fantastic games containing the league’s most potent attack. The second half was scrappy with very little goalmouth action, apart from a couple of half-chances for each side. Extra time arrived and the home side took the lead with a very fortunate goal. A cross into the Selsey box evaded the centre half and was converted via a fortunate deflection by the league’s top scorer Lewis Hole. Selsey rallied briefly but couldn’t force possession into clear-cut chances. As the Blues pressed forward it left gaps at the back and late on, Hole grabbed his second to kill off the game. Selsey return to league action this week with a trip to Storrington. Selsey: Boyt, Lynch, Low, Dines, Goulding, Morris, Morey, Agostinelli, Forry, Smith, Platt. Subs: Cavell, Williams, Briance.